I'm aware there are some similar threads out there, but I was just curious what your guy's favorite (weird/exotic/uncommon but obtainable) vegetables are? Interesting leafy green suggestions especially welcome. After all, there are way fewer kinds of meat than types of vegetables and it seems like vegetable variety is a great way to introduce more variety into what you eat. usually when I'm leaving my local and awesome korean green grocer they ask me if I'm shopping for a family as I have so many vegetables. I usually just blush and say yes. thats pretty much it. Most of my meals, for convenience sake, tend to basically be some kind of salad for lunch topped off with roast meats from the night before. At night, unless I have more time/am feeling adventurous/not fasting I'll typically eat an omelette, throw together a stir fry or make some kind of grilled/roasted/slow-cooked meat. -this is obviously different for everyone, but what is your typical plant:meat ratio? I've been eating a TON of meat recently and was wondering if this ratio is especially important. -THIS ONE IS IMPORTANT: how long after purchase do you eat your vegetables? I've read/heard that their nutritional value starts to decline after a few days. Is this true? absolutely agree! I lived in Japan for five years and i think I ate daikon prolly daily. Fantastic fresh crunch if juliened, you can grate it into like a horseradish type consistency, you can actually braise big hunks of it. Terrific stuff. Good dose of vitamin C if i remember correctly. Has anyone ever had salsify? I've always wanted to try it. They say it tastes of oysters. Matt - I've been chowing down on these too from Sainsburys. Along with a sweet potato it makes a very colorful meal. Tried but could not include a picture.. someone please tell me how to..! Since going paleo, for some reason, I really appreciate the beauty in colorful foods. I love that you've included a photo!! Pastured butter + these= candy. """Despite its appearance, the potato now being grown by Perthshire producer Albert Bartlett after two years of trials, is not genetically modified. 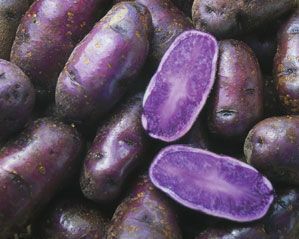 Potatoes originate from the high reaches of the Andes and come in thousands of varieties, with many having developed deep red and purple colouring. """ Look for international/Korean groceries. H Mart is common to big cities. I second the artichoke vote, they are terrific and a good vehicle for butter with a bit of lemon... delish and a lot of fun to eat or share. I can't find them where I live, so jealous. I LOVE fennel! It's sometimes called anise - it's a white fibrous bulb with green stems and a delicate ferny top. It tastes a little like licorice and it's delicious raw or cooked. I'll eat a whole bulb chopped up raw, the texture is a little like celery, and it's so crisp and refreshing with a big plate of meat and fat. It's also great roasted and good in soups. It's my "powerhouse" right now because I've been craving crunchy veggies, but have been avoiding brassicas, and it's one of the only ones that satisfies that's not in the brassica family. If you're ok with brassicas, cauliflower is awesomely delicious when roasted. It turns brown and sweet and is so good when it's just slighly crisp-tender. I like to season it simply with salt and pepper before roasting, then add chopped rosemary, lemon juice and zest, and chopped capers afterwards. One of my favorite meals - I can eat a whole head myself this way, although everyone I've shared it with loves it, so I end up sharing a lot. I was also eating a lot of kohlrabi earlier in the fall. It's a green funny-looking round veggie - kind of turnip-like in texture but very crisp and a little sweet - good for eating raw if you're not too worried about the brassica thing. Beets are great, steamed or roasted, and go well with a little orange juice or zest. The greens are also tasty and can be sauteed with a little garlic and onion. Swiss chard is another great leafy green, chopped and sauteed with garlic in butter. Squash are also great this time of year. The little summer squash, of all shapes and colours, can be roasted up and eaten, skin and all. I have three little pumpkins, a delicata and a butternut sitting on my windowsill waiting for their turn in the oven. These are all fairly high on the carb-meter but I don't worry about carbs from veggies as they're pretty much my only source. I'm probably heavier on the meat than the veggies right now, maybe 3:1. I keep veggies for a long time in the fridge. I buy them super fresh from the farmers market so I don't worry too much about lost nutrients. I'm also not afraid to eat them when they're looking a little wilty, or to toss them in the stock pot when they're less than fresh-looking. I also have some mesh fabric bags that help keep greens fresher for longer. I use these: http://www.carebagsonline.com/ but I'm sure there are similar products wherever you're located. More antioxidant power than blueberries, my favorite head turning post workout, kerrygold slathered treat! If you're looking for some non-traditional leafy greens, check out an Asian Market. Many times the variety trumps that of western markets. Some of my favorites include: Chinese Watercress, Chinese Broccoli, Pink Leaf, Chinese Spinach, and Choy Sum but there are many, many more. Didn't see lambsquarters in anyone's list. This is a ubiquitous-growing leafy green that I don't see in supermarkets. Incredibly rich source of vitamin K.
Okra, yummy just steamed.. I love the slime and the soft seeds. I'm weird. I know. I sometimes pick mallow from the surrounding hills. They are a wild weed that grows big and lush and tastes quite decent, especially with ranch dressing. I believe various forms of mallow grow wild in many areas. Few people realize the are not only edible but decent tasting and nutritious. I like kale/collard greens/spinach for dark leafy greens. Romaine lettuce also has a good amount of nutrients. Nothing too weird, but avocado, artichokes, hearts of palm, most of what you mentioned and a lot of broccoli. We also like bok choy quite a bit. Veggies make up less than 25% of my intake (by weight) - rough estimate. Some days more (much more) and some days none at all. I don't really worry about it much. I don't know if it'd be considered a vegetable but my childhood home had these clovers that grew in huge bunches and they had very tart/sour stems and i would always chew on the stems. to this day if I find a bunch I pick it and chew on it. Kohlrabi boiled and cut up and tossed with butter. Really good! Oh yeah I tried Yucca. It's alright. I want to find a good recipe for Yucca fries because it was too bland just boiled. Should have put butter on but had already done coconut oil. My go to is a cookie sheet of winter squashes and root veg. cubed and tossed in melted coconut oil and roasted. I put it in a bowl in the fridge and reheat or make soup with it all week long. No waiting for squash or sweet potato to cook after work. Kimchi on everything:) No really... I found that during my 4 week challenge I could rid myself of sugar cravings by eating a small bowl of kimchi or adding it to my dinner plate. I also used some of the Kimchi juice to ferment roasted beets. Nice and tart/sweet and spicy that way. My absolute favorite vegetable is brussel sprouts. I roast them after cutting them in half, tossing with some melted butter, lemon juice, and pine nuts until they are all crispy on the outside. I add some salt & pepper at the end and even some goat cheese when the mood strikes me. I could eat them every single day. Some weeks, I do. They have a long shelf life, similar to cabbage. And they freeze well too. You just have to blanch them first. I'm reminded by this post to get some daikon radish. A huge white carroty looking thing, that shredded and eaten with fatty meats is supposed to aid digestion. It's moist and tastey. I like Nappa cabbage (Chinese cabbage) sliced up and stir fried with shredded carrots too. Try these fiddle head ferns - when in season..
Purple potatoes from my local Sainsburys supermarket. No very weird really as they are just normal potatoes but they are very blue when cooked. These are a new variety called Purple Majesty and developed at Colorado State University by cross breeding old varieties. They are now being grown in Scotland. The colour is pretty cool. My ratio varies wildly from day to day and month to month. I tend to want way more green veggies in the summer (more in general, actually) and more starchy ones in the winter. Sometimes I don't want any at all. I try to eat stuff pretty quickly (obviously there is more wiggle room with some squash, root veggies and other traditionally winter vegetables) and throw anything I don't get to before it starts getting a little squishy into a soup or stir-fry to use it up. Not weird but I often eat purple potatoes from Sainsburys (not sweet potatoes) with sweet potatoes. Very colorful and reminds me of home (LSU colors. Throw in zucchini and it's Mardi Gras). Swede (rutabaga) fries are great. Fennel root in anything slow cooked.